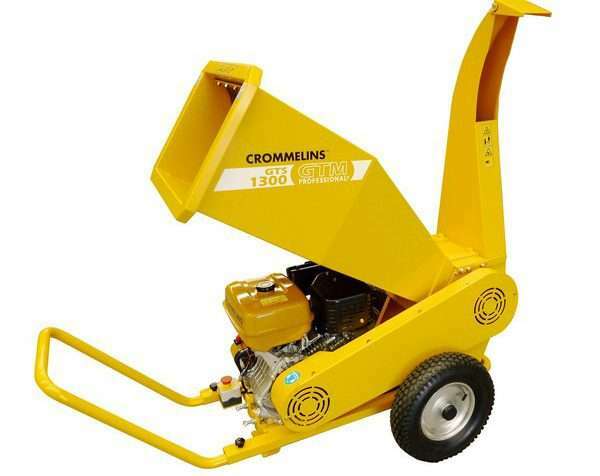 Crommelins are continually exploring new products for the Hire and Rental Industries and as a result have added the New 9.0hp Crommelins Wood Chipper (GTS900S) to their Groundcare range. Standard with all Crommelins Wood Chippers is a host of safety features to make their models ‘Seriously Safe’ for domestic and light industrial use. They are fitted with 2x Emergency Safety Stop switches at hand and foot level, 2x Actuators to disable the machine while the Hopper or Chute is off/opened and a Recoil Start Lock to prevent drum rotation during maintenance and cleaning, a Rubber Curtain prevents chip throw-back. The 9.0hp Model can process up to 60mm green wood and it will even chip through palm fronds without them wrapping around the blades with the cutting action of its twin 195mm wide reversible chipping blades and an adjustable anvil. This model can be modified to Hire-Spec by adding dual Lifting Hooks. The GTS900S is built tough with a powder-coated steel body, has a wide 250x250mm Input Hopper, a removable front handle, 2x Tie Down Points for stable transportation and16” pneumatics wheels and its narrow 630mm width allows for easy access into back yards. This machine is designed to be simple, easy and safe to use. The GTS900S comes with 3yr Subaru engine warranty, a Crommelins™ branded 2yr manufacturer’s warranty. For further information call 1300 650 659 (East Coast), or (08) 9350 5588 (WA Metro) and 1800 655 588 (WA Regional) or visit their website www.crommelins.com.au.